The estate's name comes from nearby Clifford Bay, located at the eastern entrance of the Cook Strait and the Tasman Sea. To the north are the stunning White Cliffs and beyond that is Cloudy Bay. Since first vintage in 1997 Clifford Bay have worked diligently to produce fruit driven wines that are finely balanced, refreshing and pure. 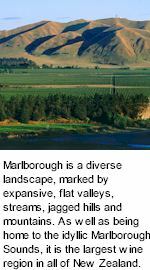 The Marlborough growing region is a diverse landscape, marked by expansive, flat valleys, streams, jagged hills and mountains. As well as being home to the idyllic Marlborough Sounds, it is the largest wine producing region in New Zealand. Marlborough is one of New Zealand’s sunniest and driest areas: the region receives about 2,400 sunshine hours per year. Warm days, cool nights and an average daily temperature of 18º C (64º F) ensure that Marlborough wines possess vibrant fruit flavours, firm acidities and heightened aromatics. Clifford Bay harvest fruit from both estate and grower vineyards located in Marlborough’s two marquee regions: the Awatere and Wairau Valleys. All vineyards are Sustainable Winegrowing New Zealand certified. Awatere Valley takes its name from the local river and is the cooler of the two regions. It features a unique stony Greywacke alluvium soil that is well draining and ideal for grapes. Wines from Awatere tend to be high toned, ethereal, vibrant and minerally. Wairau Valley is located to the north of Awatere, this region derives its name from the Wairau River which flows from the mountains in the west to the ocean at Cloudy Bay. It possesses shallow, stony, fast-draining soils that encourage low yields and powerful, bracing wines. Clifford Bay Sauvignon Blanc is all about expressive fruit flavours. The wine possesses a light straw colour and tropical aromas of guava, melon and citrus. The palate exhibits the same fine flavours followed by a crisp, dry, flinty finish. One of the charms of our Pinot Gris is its subtle elegance. The wine delivers aromas of pear, apple and spice followed by flavours that are round and concentrated. The lively finish possesses the distinctive minerality found in all of Clifford Bay wines. Clifford Bay Pinot Noir is always a wine of elegance and balance. The bright garnet colour opens the door for vibrant aromatics packed with black cherries, violets, red fruits and spicy French oak. The flavours are intensely fruity, lush and delicious. As with every Clifford Bay wine, fruit is the focal point in the Chardonnay. A subtle dash of wood only enhances the citrus, apple and pear notes in the nose and on the palate.